Becky Masterman took readers by storm with her retired FBI agent, Bridget Quinn, the protagonist of 2013’s Rage Against the Dying, which introduced the feisty newlywed in a suspenseful debut. 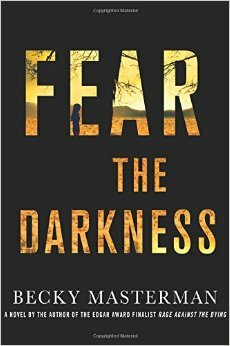 She returns to Tucson with Bridget and her husband, Carlo, in this year’s Fear the Darkness, and it’s every bit as suspenseful and compelling as the first. Much has been made of having a 50+ protagonist as the center of a series, and it’s a refreshing change to see a strong woman who knows her own mind and can give as good as she gets in many circumstances. With Carlo’s history as a lapsed priest, Bridget is trying out a church with him, and making friends in the community. Their life with their two pugs is starting to settle into suburban bliss when her ill sister-in-law dies, and Bridget’s brother begs them to take in his seventeen-year-old daughter for the summer to complete the residency requirement for college. The couple’s trip to Florida for the funeral gives readers a glimpse into Bridget’s family and background, and when Gemma Kate arrives, it’s bound to change the dynamic of their home. With Gemma Kate suddenly thrust upon them, the adjustment period is rocky right from the start. And then one of their beloved pugs almost dies just as Bridget agrees to investigate the death of local couple’s son. Could the pugs illness been a deliberate poisoning by Gemma Kate? Was the boys death a suicide, a tragic accident, or a case of murder? Bridget and Carlo soon realize they don’t really know the stranger in their midst, family or not, nor what she’s really capable of–and then Bridget starts to have unusual medical symptoms just as her investigation heats up and she will have to call on all of her skills and training. How the two are connected will come as a surprise to most readers, and that’s one of the skills Masterman employs in this thoroughly satisfying outing. Auntie M enjoyed seeing another side of Carlo, the professor Bridget loves, and how this later-in-life marriage and its adjustments affects them both. Entertaining and quickly read, this sequel is another thrilling winner.